Ostermann now offers the popular handle profiles in the trend colour black as well. These are a perfect solution for dark fronts, blending in with the surface. But in combination with light surfaces, they deliberately accentuate the front, giving it an attractive, linear structure. The wide range includes handle profiles in cut lengths or made-to-measure, as well as numerous handleless systems and recessed handles in various measurements and surfaces. The handles can also be cut to individual lengths upon request. Ostermann stocks numerous aluminium handle profiles for various cabinet widths. The popularity of dark or black furniture fittings (hinges and handles) is growing. 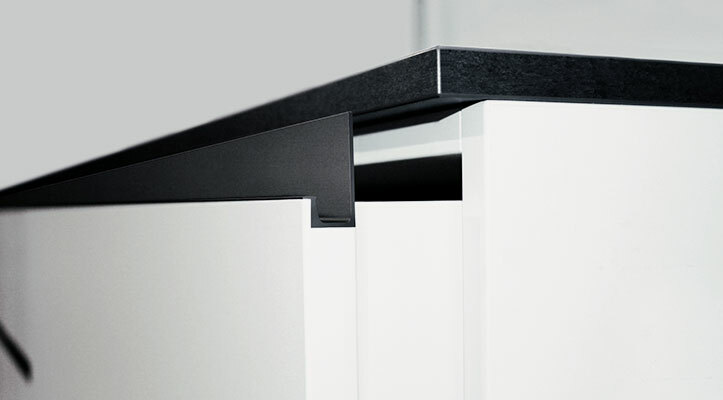 This is more than enough reason for Ostermann to extend its large range of handle profiles (in cut lengths, made-to-measure or as handle profiles for cabinet widths). Therefore, the more than 40 different aluminium handle profiles are now available with the surface variant "Black anodised, matt", as well.